L2S » Guides » Content Creation » How Long Should My Blog Post Be? Some blog posts are only a couple paragraphs, while others might be 5,000 words long. Ever wonder what the best Blog Post length is that you should aim for when you are trying to add new content to your website or blog? The answer (which is almost the same whoever you ask) is “it depends”. It depends on what kind of posts you are creating. It also depends on who you are wanting to attract to read you blog or visit your website. As you are write, focus on good, strong content for your website as well as determining the perfect length of your post. Here are a few things you need to keep in mind that can help you create the most successful post. Recently, I was visiting with the director of an adoption agency. He told me how his employees write many new articles with new content each day. His goal was that, within 6 months of his position as director, he would have a piece published for their blog that didn’t require any editing whatsoever. The chief editor laughed at his goal because editing is a must when you are writing a blog post. Sure enough, with just a few days left before his self-imposed deadline, he wrote his piece that required no edits from the chief-editor and was published. Does this happen every time? Obviously not, since it took him the better part of 5 months of writing everyday to get to that point. Was there improvement? Yes, absolutely! Practice makes perfect. When you are trying to write the perfect blog post length, know that it takes practice. You will improve overtime to find what works for you. It is important to captivate your audience and provide them with something new or current so that they will keep coming back. Write to the level of your audience so they will be able to understand the information and content in your blog, no matter their background or educational level. If you can write to their level, regardless of who they are, you will keep having readers coming back for more. When you are creating new content for your blog posts, remember that you need to be consistent in all forms of communication. Facebook, Twitter, Instagram, your blog and content article all represent who you are and should have the same voice across the board. You may be wondering what to do when all these different forms of communication require different lengths for their posts. If you are able to write a blog article containing 2,450 words, you should also be able to write something that will attract readers to the blog in just 160 characters on Twitter. As I mentioned earlier, the perfect length for a blog post depends on why you are writing the article. If your goal is more views overall, then you may want a longer post of at least 2,450 words. No matter your end goal, here are some of the advantages and disadvantages for different blog post lengths. Trial and error with your blog posts may be the best way to learn the perfect length for your audience. You can see which posts received the most attention. After a while you will be more comfortable and know what works best for you. Here are some suggestions that we have found to create the best length for a post and why! Do you want comments on your blog post? If your goal is to get more comments for your blog post, then shorter may be better. Why? The content is easier to understand. There is less information to internalize for the readers and it is much easier for them to articulate a comment on their opinion regarding the post. We recommend that posts designed for comments should be no longer than 275 words! Read this article to understand how short blog posts can have an impact. Short posts are great for generating comments and discussion, but short posts aren’t best for bloggers just starting out. Short posts will not be shared as frequently as medium posts will be. Are you wanting shares on social media platforms? A social media platform is any form of social media where people post about anything and everything. While there are several to choose from and use, the most popular platforms are Facebook, Twitter, Instagram, and Snapchat. Each social media company has different ways for you to post in order to communicate with your followers. Facebook gives you the potential to write any amount of words, Instagram is close behind, and Twitter limits your posts to a mere 160 characters. To get shared on social media, you need to have realistic expectations. If your audience is small, then you may not get many shares. While on the other side of the spectrum, if you have several hundred or thousands of followers you should expect quite a few more shares on social media. The more followers you have, the more likely your content will be shared. We recommend for getting shares on social media that your blog post length be anywhere between 600 to 1,250 words. Why 600- 1,250 words? Well, it is more than just a small ordinary post to generate conversation and get comments. Yet, not quite long enough that the blog will require a lot of time to read and understand. How many times have you opened up an article on social media but quickly close it because it is just too long? To help put this in perspective try to imagine the blog posts that you have already read and seen on social media. Not too short, not too long, just the right length. That is why we recommend the 600 to 1,250 word count. To generate more content for SEO purposes, this medium length is great. Not quite as good as longer blog posts. It can still gain traffic if the content you write is strong content. Strong content is full of information and packed with helpful facts that the user can benefit from. Google can then recognize the length and the topic of the article that you are writing. Are you wanting more traffic from Google to your Blog Posts? If you had the choice between two things, either having more shares on social media or more traffic from Google searches, which one would you choose? Google Searches should be your goal and what you should strive for when considering your blog post length if you want to generate more traffic to your website. You may start with not very many searches and clicks on your blog, but as you write blogs that are full of useful information, the traffic on your site can increase. Google is able to understand what is written on your blog based on the keywords that you include in your writing. Keywords are words that you choose to include in your posts to generate searches. What does this do for your blog posts? Whether or not you specifically use search engine optimization (SEO) to rank on Google, well written and informational blog posts can still rank on Google. Ranking on Google simply means that when you search for something like “European Cooking Blog” several results come up. Each new website listed on your search ranks differently. When I did a search the blog for European cooking blog, Saveur was ranked number 1. 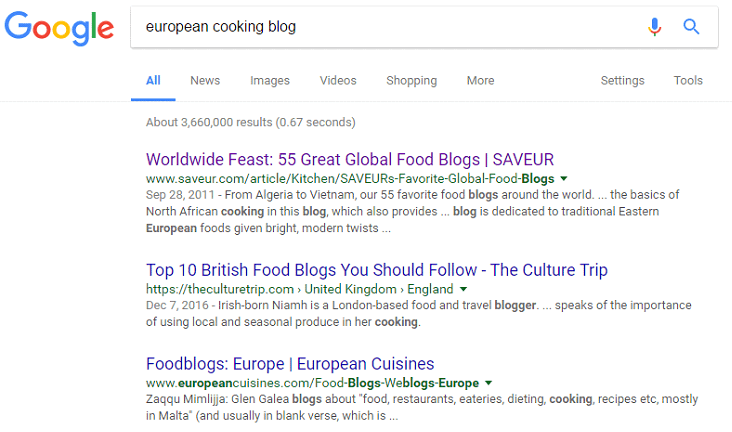 Although this blog doesn’t specifically say “European Cooking Blog” the article was able to rank on Google as #1 in searches because the content was filled with what Google sees as strong content. If you want to start ranking higher on Google to get searches to your blog post, longer and researched posts will have a better chance. We recommend for articles to be ranked high on Google the length should be at least 2,450 words long. Make sure that the blog is well written, edited, and easy to understand. Your post should focus on giving strong reasoning behind the purpose of your post. Longer blog posts may not get many comments, but they don’t need to, that is the purpose for the shorter blog posts. You may not get too many shares on social media because the post may be too long to read in passing (as we often do with social media.) However, what the long posts will give you is more views and rankings on Google to generate more traffic to your blog post over all. There are many different blog lengths you can aim for, of course, depending on the reason behind the post. Let’s review how long your blog post should be…. These posts will get directly to the point and don’t bother with any fluff. It typically will generate more conversation in the comments but won’t get the same crowd reaction with social media as the longer posts. Just want to talk to your followers? Here is the perfect option for you! These posts will not gain popularity through Google searches, but they are great to get people talking. You never know what may happen! Continuing with Google Searches, this length isn’t quite long enough to start gaining any rankings with Google. Although not long enough, this is a great starting point to shoot for in length of blogs. This is the usual length in blogging information on social media. This is the perfect starting point to learn how to be a more accomplished writer. As I was looking into writing 750 words, I came across a website, focusing on writing 750 words every day to improve your writing. We have been talking about writing for your blog posts, but this website describes writing to gain experience for yourself. Try it out; have fun with it! Other reasons for 750 words would be that you are able to link up with other bloggers or get others linked to your blog easier. Links from others will help your website and blog become more popular. This is when the posts start to get really meaty. The more information in the content the more your readers and followers will enjoy it. Blog posts that have at upward to 1,500 words, on average, will gain 68.1% more tweets and 22.6% more Facebook likes than other posts that are shorter, and for every extra 100 words in your blog post length, your readers will stay on the page for an average of 4.4 seconds longer. According to this article your readers may not read every single word in the blog post, and may read about 18 words in that same amount of time, 4.4 seconds. Many skim through the information and see if they can catch any useful or factual information. So make it a good read! 2,450 is the most dense of all the articles that you could write to get more views for your blog post length. It is very difficult to devote the time required to write an article in this length. Unless you have a team to write with you, it is very unlikely you will write 2,450 word articles every single day. If you want original content like this to be posted daily or several times a day, make sure that you delegate the responsibility and get many eyes on the project. Since we have talked so much about Google in the article, if you were to do a search on Google for other blogs like your own, on average the top 10 searches will all have 2,000 words or more. This is amazing for your blog to grow and prosper with more views because Google is able to understand content and when people search for the topic of your blog, strong content will show up for them as a relate-able search. All things considered, stay true to yourself and write the way you want to write. When it is all said and done, always remember to deliver the content that you want to. If you can write the same amount of content in 50, 250, or 2,500 words, write as long as it takes you to in order to get the point across. Your technique in delivering the message is uniquely you. We have enough people trying to be someone else in the world, so just be you. Sometimes you just have to say everything that is on your mind, great! Write about it. Sometimes you have very little to say, well, write about it! This is just representing who you are and that is what people want to see in your blog posts. No matter the length, make sure you take the time to make the message clear and edit for any spelling or grammatical errors. Don’t post too much, and too far apart. Write what you feel inspired to to make the content genuine and not forced. With proper spacing and breaks in your writing your readers can scan it more quickly. This helps them to find what they are looking for or to get the main idea of the article. Lastly, as you keep all of these suggestions in mind, work on making the content flow well to meets the purpose of the article. Sharing on Social media, requires a few hundred words, while ranking on Google might require a few thousand. Always remember to be consistent in writing for your audience but mix up the length of different articles so your reader can find an article that fits the amount of time they have. If you want the perfect example of this, TED talks vary in length from a few minutes to several minutes long. If you want to give a blog post that takes time to read and take in, consider a longer post, if you want to give a quick read, consider a shorter post. Find what works for you and don’t be afraid to experiment!